This feels good! What is it you ask? Starting a new album. I stopped working on the family albums for a few years because I was trying to get Kaela's high school albums finished before she graduated from college and with the help of Studio J, I was able to accomplish that goal. But that has left me very behind in my family albums. Just about finished, the last few pages to go are in kits and in the crop room. Those will be finished during the next couple of crop nights. I started working on this album then Amy and I decided that we wanted to go on a retreat as our Christmas gift to each other. So I stopped working on the album to make page kits of the remaining photos. I will take these kits with me to the retreat and play for 4 days. I have 28 (2 page layouts) kits ready to go. I was going to use my "trash can" rolling cart but decided that since I am not sure about how much room there is in the retreat crop area it might be better to have a crate that can roll under the table. I am re-purposing my "retired scrap cardstock" crate for this purpose. The bin has ALL of my stitching supplies because I can not help myself when it comes to hand stitching on my layouts and a few extra embellishments. Then of course my tools. All I have to do is remember to put my trimmer in the cart and I am ready to go. This is the one that I started last week. I have a little work to do because while I printed the photos to scrap, I forgot to do any of the journalling. (gasp!) Once the house is quite on a night I can not sleep I will sit down to do all of the journalling and print it out on vellum. That is the plan in my head but knowing me I will also continue to work on a few pages at time and do the journalling as I go. But I still like to get the memories on paper as fast as possible before I have a chance to forget the details that make the event special. Some of these photo might look familiar to you. 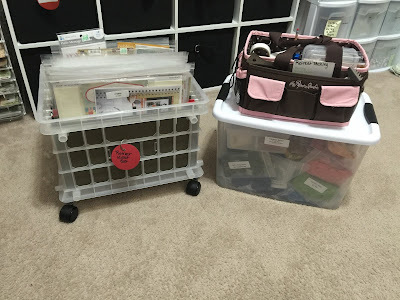 I used them in Kaela's school albums and saved a few for the family albums since she will be taking her scrapbooks with her when she moves out. I wanted the memories too so I will scrap them again. I also found a vacation album box from 2011 that I organized with the photos, journalling and memorabilia that I forgot to even scrap. Nope - I do not think I am going to run out of projects to scrapbook.